Source: Provided by CBB Promotions and the author in exchange for an honest review. Where will Ice Cream Man work next?? Ice Cream Man knows there’s lots of work to be done! Whether it’s cheerfully posing next to chocolate cake, beaming team spirit as 1/8th of a sunflower, or glowing bright as he becomes a fabulous night light, Ice Cream Man is ready for the job! This delicious, quirky children’s book by internationally acclaimed Japanese artist Naoshi combines a whimsical story with colorful sunae (sand art). A “Look & Find” section challenges youngsters to scour the pages for small details, and a “How To Make Sunae” section guides readers step‐by‐step through a “sand painting” art project of their own. “Ice Cream Work is a meticulous and stunning piece of art. 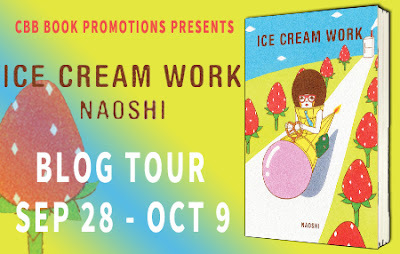 The story exudes a loopy, anarchist joy: chronicling the adventures of a hard­working and stylish frozen dairy confection and his eclectically industrious week.” ­­ Dale Bayse, author of Heck, Where the Bad Kids Go series. This is an interesting concept for a children's book. Basically it's about the typical week in an ice cream cone's life and how much they get paid per gig. I'm giggling just thinking about that. The illustrations are unique and have this cute anime vibe to them. Died laughing when ice cream man had to be a golfball. He got paid a grip for that, lol. A nice surprise for kids (and me) is the game at the end of the book. It's kind of an I-Spy game and those are always fun. Plus there's a "Sunae" art project for kids to do as well. 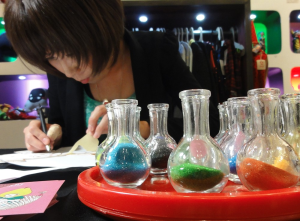 The illustrations in the book are made using colored sand so the author instructs kids how to make one of their own. Very cool. Naoshi is an internationally acclaimed Japanese illustrator whose distinctive characters and original style are recognized around the world. She uses shiny colorful sand to create surreal people living in the real world. She has participated in a wide range of projects including gallery exhibitions, commercial work, and children’s workshops. Naoshi is a Tokyo based artist currently living in Los Angeles. I'm so happy you enjoyed this one! Thank you so much for hosting a tour stop and sharing your thoughts!